Hand painted oil paintings is produced and wholesale that it has been our traditional field.GOLD APPLE ART created in 1999, is a set wholesale and export of oil painting production-oriented enterprises.We are a professional hand painted oil paintings manufacturer from China. We have more than 400 excellent artists to serve you with a huge collection of oil painting designs.In China,we have own oil painting factory,there have set up dozens of specialized studios under the factory.We produce and wholesale all kinds of hand painted oil paintings reproductions, wholesale portrait oil paintings, original oil paintings, Antique oil painting and the other oil paintings types.These oil paintings were made purely by hand by our outstanding painter. All oil paintings with the museum quality are 100% money back guarantee. We have more than 50000 paintings storage. 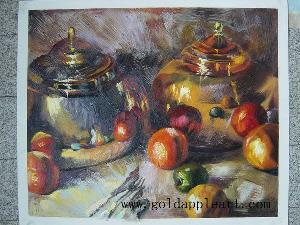 Oil painting reproductions: We have many qualified and experience artists. Our artists are good at imitating all kinds of oil painting, they can paint the color, structure and shape very accurately.Our hand painted oil paintings are always high valued and high quality by our customers.The subjects of oil painting reproductions include Abstract Painting, Animal, Ballet, Boat And Sea, Classical Flower, Classical People, Fruit, Impression Flower, Impression People, Landscape, natural, Ornament Painting, Porcelain, Poultry And Bird, Realism flower, Still Life, The Shop, Venice, Wine Bottle etc. Our website pictures is the photos of real oil painting. Our artists will paint the paintings according to photo, picture or your idea that you offer, if you have not found the oil painting sample pictures that you need in our catalogue, you can send your own pictures through E-mail cn@goldappleart.com .And tell us the detail about painting. We will do our best effort to do your every painting. We believed deeply that you will love our oil paintings. Custom Oil Painting: About the custom oil paintings, we always insisted that take the customer demand as the center, we innovate unceasingly and improve the oil painting quality, we will respect and understand the client's ideas and opinions fully.Our artists have skilled painting skills and mature painting style, so the quality of the oil paintings which we produced often exceed customer expectations,they have been very satisfied with our oil paintings. For a custom oil painting, you just need to tell us your ideas and creativity, we will be able to produce the perfect oil painting for you. If you are not satisfied with our oil painting, we will correct the oil painting until you are satisfied with them. This is a custom oil painting that according to customer requirements,we take Marilyn Monroe, Bill Clinton, George Walker Bush, Kofi Annan,Michael Jordan and other famous people into the famous painting that Eug�ne Delacroix's Liberty Leading the People. Portrait Oil Painting: There is no better way to say professionalism than with a high quality portrait painting work of art,our artist take the photos into the oil painting, you can send your photos or photograph through E-mail. Our portrait painting include Human Portrait, House Portrait, Car Portrait, Pet Portrait and so on. Let our professional portrait artists convey this message for you with a high quality 100% hand painted custom commission executive, corporate, academic or government portrait painting to hang in boardroom, your office ,your bedroom,your living room or workplace.Our portraits painting include Family portrait,children portrait,baby portrait,pet portrait, Corporate and Executive Oil Portraits, Government portrait painting and so on. An oil portrait painting of your loved one or pet painted from photograph by artist is a special gift for birthday, Christmas, wedding, anniversary and special occasions. Imagine! Now you can have a Magnificent true-to-life oil portrait painting of you or someone dear to you created just for you - at a fraction of price done by creative and well trained artist. It will become a family heirloom - handed down from generation to generation. We were paint the portrait for British imperial family, Europe's congressman,famous singers and some movie stars. Original Oil Painting: The most of our creative painters are university professors, their energy and creativity is strong.Their oil painting works have very high collection value, they have a lot of oil painting works are collected by foreign collectors and art museum. Our creative painter has the skilled painting skill and experience,also has various rich imaginations and creativity.Our creative painter may according to the picture and the idea which you provide to create the unique oil painting. For a Original oil painting, you just need to tell us your ideas and creativity,or you give us an example,or one picture and one photo, we will be able to produce the perfect oil painting for you. Master�s Works: We reorganize and collect some oil painting pictures of the very popular oil painting masters on our website, the top old masters for Claude Monet (1840-1926) France, Custav Klimt (1862-1918) Austria, Edgar Degas (1834-1917) France, Peter Paul Rubens (1577-1640) Netherlands, Rembrandt van Rijn (1606-1669) Netherlands, Vincent van Gogh (1853-1890) Netherlands, William Bouguereau (1825-1905) France . We hope you can choose your favorite painting in here.We can duplicate all these paintings.Supply oil painting. American Art: We also collect some oil painting pictures of the very popular American painter's works.These American painters are Andy Warhol (1928-1987), John Singer Sargent (1856-1925), Roy Lichtenstein (1923-1997), William Whitaker . We hope you can choose your favorite painting in here.We can duplicate all these paintings. The quality of our hand painted oil painting from pictures is superb. Utilizing some of the best talents available we deliver high quality oil painting from photo jobs. So, Our oil painting can achieve even beyond your expectation. You can see the quality of our oil painting through the following links or our oil painting catalogue. The style of oil painting as realistical,abstract,ornament,modern,classical,impression and so on.These oil paintings can be painted on board,on canvas board,on masonite board,on linen, on canvas,on paper and another many materials. We will shipping your order within 48 hours if the oil paintings are in our warehouse. We look forward to provide you with our best products and valuable service. we will appreciate the chance to serve you very much. If you have any try order, we would love to hear from you. We will do your every order with our supreme professional standard . Our purpose and aim is to provide high quality oil painting and high value services.As a Professional hand painted oil painting supplier.We offer our customer the good quality oil painting,the same time,offer an outstanding after-sale service for them.